One of my favorite things about the holidays is all of the great family Christmas traditions. Every family has them and, no matter what they are, they are special to you and your loved ones. Here are some of ours! Something happened the other night that really made me think about all of the special family Christmas traditions we honor every year. My son came downstairs the other night because he couldn’t fall asleep. This isn’t a normal thing he does so I knew something had to be up. He looked at me and said that he was just so excited for the upcoming holidays that he couldn’t sleep. He started naming all the fun holiday traditions that we normally do in November and December with a little twinkle in his eye. I think we sometimes forget that the things we do with our kids leave lasting memories. Sometimes during the holiday season, I find myself getting caught up in all the stress and hustle of finding presents and making sure everything is “perfect” for the big day. Instead, I should be seeing how my son’s face lights up when we are making Christmas cookies, or how my daughter is super proud of her homemade ornament, or snuggling on the couch and watching A Christmas Story and The Polar Express. Creating these memories with the kids is the true magic of Christmas. Christmas is truly magical. 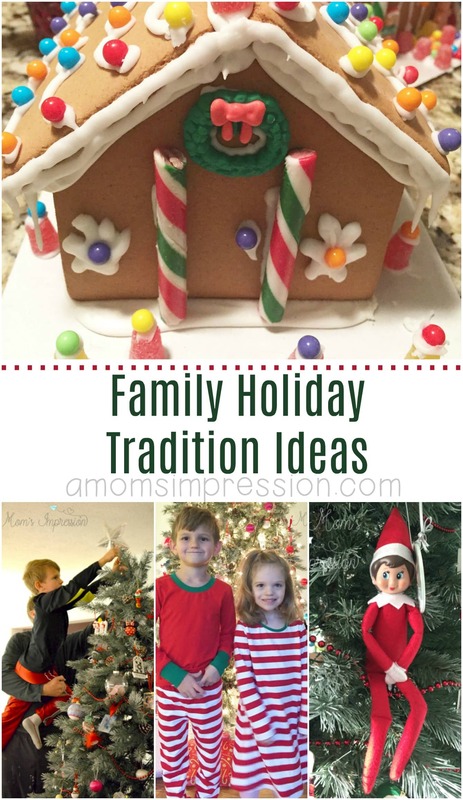 Over the years our family has created many fun Christmas traditions that start in November and continue through the end of the year. These traditions not only bring wonderful memories, they allow my husband and myself to experience the magic of the season through our child’s eyes. Here are are several family holiday tradition ideas that you can start incorporating in your family’s holiday season. Every year we build two gingerbread houses. This is one of my favorite family Christmas ideas. The girls decorate one of the houses and the boys decorate the other. We pretend to have a contest but honestly, they both look pretty good. We have been getting better and better every year. 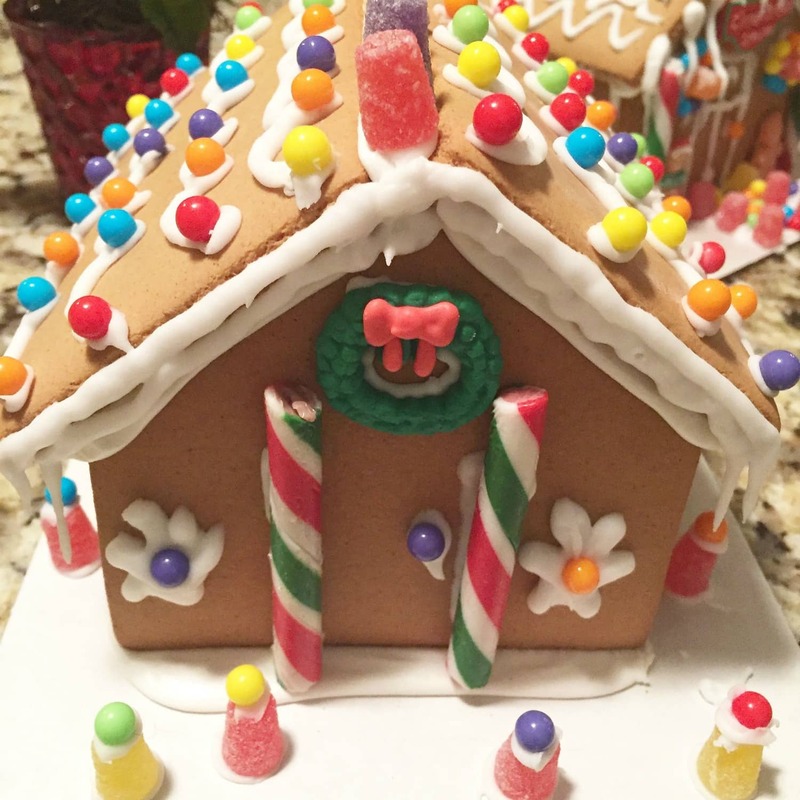 By the way, decorating a gingerbread house is way harder than it looks! Another one of my favorite family Christmas Traditions is putting up the Christmas tree and decorating the house the day after Thanksgiving. We make hot cocoa (my husband drinks some bourbon!) and cozy up together in our front room to hang ornaments. There is nothing like opening the box of ornaments for the first time in a year. I love pulling them all out and reminiscing about where we acquired each of them. So many memories. Sure, making Christmas cookies is pretty standard as far as Christmas tradition ideas go. But a lot of families overlookd making homemade ornaments. A lot of times, this is something that happens at your kid’s school. 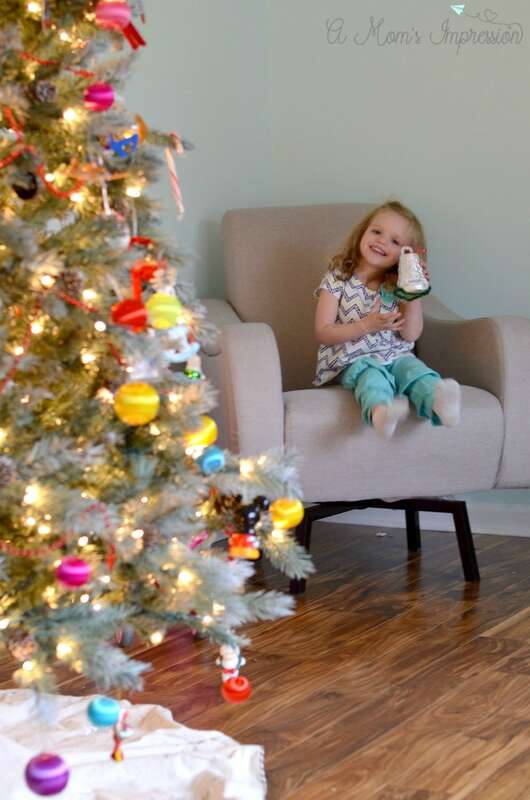 Making ornaments doesn’t have to be an elaborate affair. Caroline loved this bell she made a couple years ago. She is my little artist, so every year she gets really into the ornament making and cookie decorating. We make treats to deliver around the neighborhood. The kids love it! I started the tradition of giving the kids Christmas Pajamas every Christmas Eve ever since Jonah was born. We usually stay in them for most of Christmas morning. 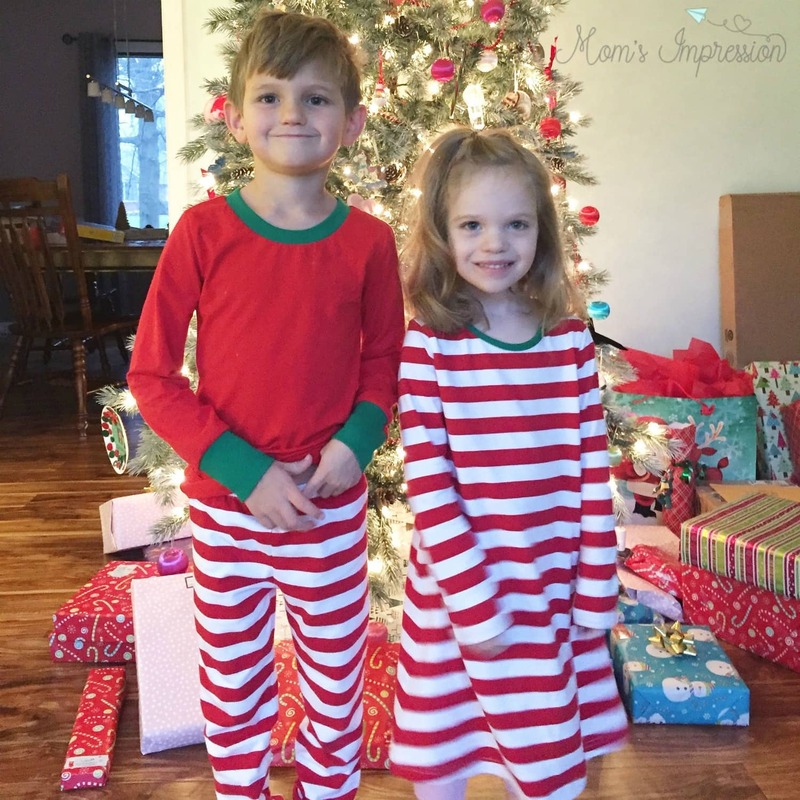 We get a picture of the kids Christmas morning in their pj’s before opening gifts. We started our Elf on the Shelf tradition when my son was 2 1/2. We adopted a Scout Elf whom my son named Ryker. Ryker has been with us for several years and last year he decided to bring a friend, a girl scout elf that Caroline named Snowball. If you are unfamiliar with this tradition, you can adopt one of Santa’s Scout Elves to visit your family and report back every night to the big guy. In the morning your elf will return but will be in a different spot in your house. Kids can talk to the scout elves but they aren’t allowed to touch them. The Scout Elf tradition has been so much fun. Every morning the kids run downstairs to find out where the elves are hiding. They start talking about the elf’s return shortly after Halloween. It has been a fun experience seeing their little faces light up when they come downstairs to see where their elf friends have moved. They leave messages for Santa for their elf to bring back to the North Pole at night. The elves have made Christmas just a little more magical in our house! Whatever holidays you celebrate with your family, be sure to stop and experience the magic with your children. 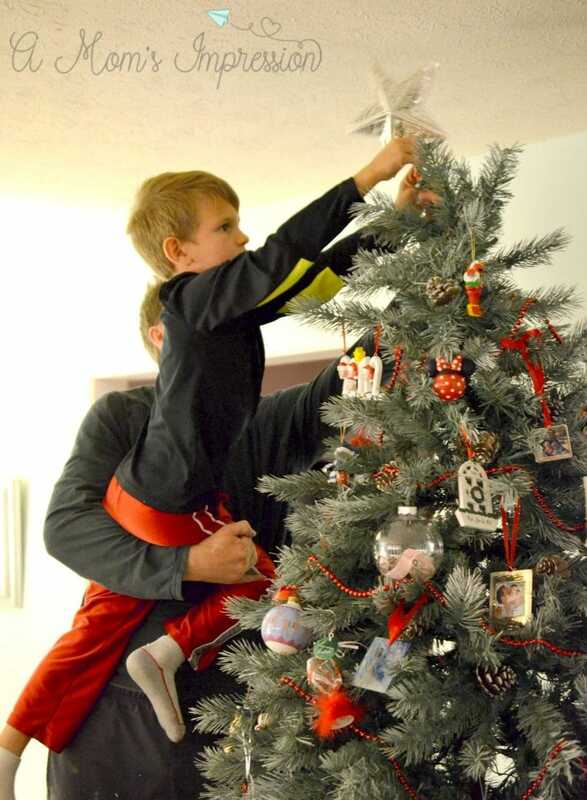 Create family traditions that your kids will pass down to their kids. Stop and enjoy the holiday season! Be sure to follow me on Instagram this holiday season to see where we find our two Scout Elves every morning! 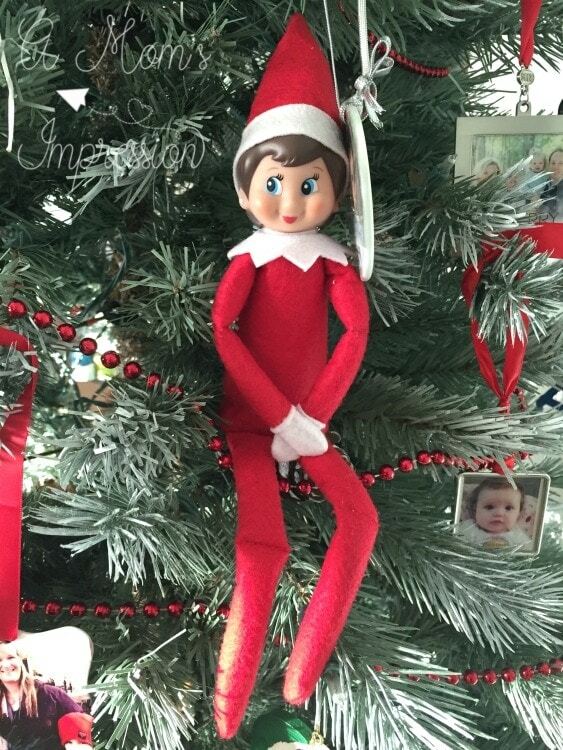 While you are on Instagram be sure to follow Elf on the Shelf and see what all the scout elves are up to! Also, check out our Scout Elf Return Breakfast from last year as well as our interview with the Cheif Scout Elf, Chanda Bell! To learn more about the tradition of Elf on the Shelf tradition, be sure to visit the Elf on the Shelf website!